ST. LOUIS – Glass Half Productions, an independent production company, has announced the development of a television drama series that will be produced in, and about the future of, the St. Louis region. 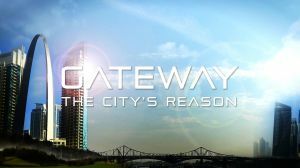 Gateway: the City’s Reason is a poli-sci-fi television drama set in the American heartland city 50 years from now. In the pilot phase, viewers will be able to watch episode segments for free on the Gateway-TCR web site. Episode “segments” will be approximately 10-15 minutes in length. When all the segments of an episode are complete, they will be aggregated into a single episode for release on Vimeo, Amazon and other web distribution outlets. Local broadcasts, DVDs, a graphic novel and a short story series are also being explored. Advertisers interested in communicating with Gateway-TCR’s various audiences will be invited to purchase valuable “content adjacency” near the episode segments, on content platform pages and within the series promotional media.